dmtheory: Q: What do you do after fasting from meat, dairy & alcohol for 40 days? Q: What do you do after fasting from meat, dairy & alcohol for 40 days? The Easter ritual at my church goes like this: just before midnight everyone gathers at church for the resurrection service, which lasts until about 1:45 AM. Then, we all go home for a few hours' sleep before getting back together on Sunday afternoon for a HUGE potluck picnic, featuring roasted lamb, lots of homemade goodies, and BYO beer and wine to share/trade. 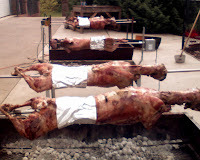 This year we cooked a total of 13 lambs, and about 450 people showed up. Believe me: after nearly 6 weeks of not eating meat, nothing tastes as good as a bite of roasted lamb picked hot off the still-turning spit (see? even the lamb knows he's tasty)!